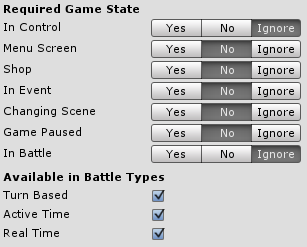 Game states link the availability of features to the current state of the game (like showing a menu or fighting). In Control: The player be controlled. Menu Screen: A control blocking menu screen is being displayed. Shop: A control blocking shop is being displayed. In Event: A control blocking event is being performed. Changing Scene: A scene change is being performed. Game Paused: The game is paused. In Battle: A battle is being performed. Additionally you can select the battle types (turn based, active time, real time). Yes: This state is active (e.g. the player can be controlled). No: This state is inactive (e.g. the game isn’t paused). Ignore: This state is ignored (e.g. it doesn’t matter if there is a battle going on or not). If In Battle isn’t set to No (i.e. 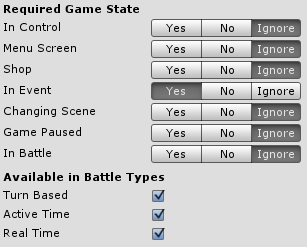 either Yes or Ignore), you also need to select the battle type for which the condition is valid. The following game state condition is valid when the player can be controlled or is in a battle. If you would set In Control and In Battle to Yes, the condition would only be valid while in a battle where you can control the player. This example is only valid while control blocking events. All other states are set to Ignore, because the condition should be valid whenever a control blocking event is being performed, regardless of other game states.